The Kertikli Bath is a splendid Turkish bath complex visited for its popular domes. 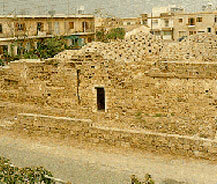 This building is constructed by the Ottomans close to the present day Enkomi village which dates back to the 2000s BC. The building is consisted of six domed rooms, a water reservoir underneath covered by a vault, and a special section (the roof of this section has collapsed) believed to be the dressing room. Framed by modern buildings, the Kertikli Bath gives only clues of its former glory in the present day.